The first ISOJ, back in 1999, was held in a small conference room with about 70 attendees and speakers from the U.S. Now, 20 years later, the annual event regularly attracts 400+ people from dozens of countries around the world. The 20th ISOJ, which will be held April 12-13, 2019 at the University of Texas at Austin, will bring together professional journalists, media executives, digital news innovators and academic researchers in the U.S. and abroad. The annual conference serves as a place where professional relationships are made, global media trends are predicted, and creative ideas are shared. Our ISOJ archive offers up a detailed look at some of these trends and ideas — and the ways in which they’ve shaped the evolution of online journalism over the past two decades. During ISOJ 1999, we explored whether the search for money was threatening editorial integrity, and how traditional newsrooms were reacting to online journalism. These topics and the conversations they sparked show how much has changed throughout the years — and, in some cases, how much has remained the same. 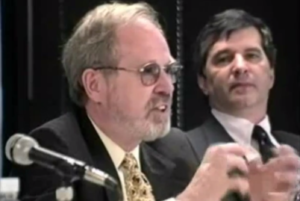 Douglas Feaver, editor of washingtonpost.com, speaks at ISOJ 1999. “What is happening with people, the consumers, their attention spans are getting shorter, at least mine is. There are so many choices; I can go here, there, there, there. Journalism is going to have to adapt to that. We are going to have to figure out how to offer a lot of information to a lot of people and that means coming up with alliances. The New York Times will probably will have to align itself with a major TV network with perhaps radio stations, perhaps with others and combine those feeds into some sort of a new media. This is an ‘interim medium.’ What we are seeing now is just the tip of it. 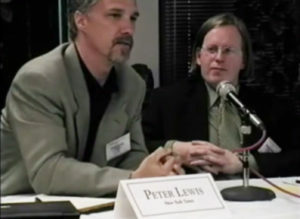 Peter Lewis, columnist for The New York Times, speaks at the first ISOJ in 1999. You can watch videos and read transcripts from the 1999 symposium here, and peruse the full set of archives here.